Philadelphia, PA, May 18, 2011 — Business Clubs America of Philadelphia (BCA) officially announces it July special guest speaker. 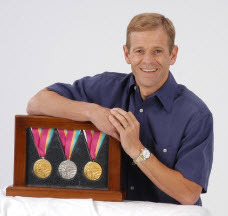 Peter Vidmar, Olympic gold medalist, will be the guest speaker at the July 22, 2011 BCA Breakfast. A few highlights of Peter’s career. If you are not a member, but are interested in this event, please call Ralph at 215-735-2871. This entry was posted on May 18, 2011, 1:17 pm and is filed under BCA News. You can follow any responses to this entry through RSS 2.0. You can skip to the end and leave a response. Pinging is currently not allowed.